7 PASSENGER! 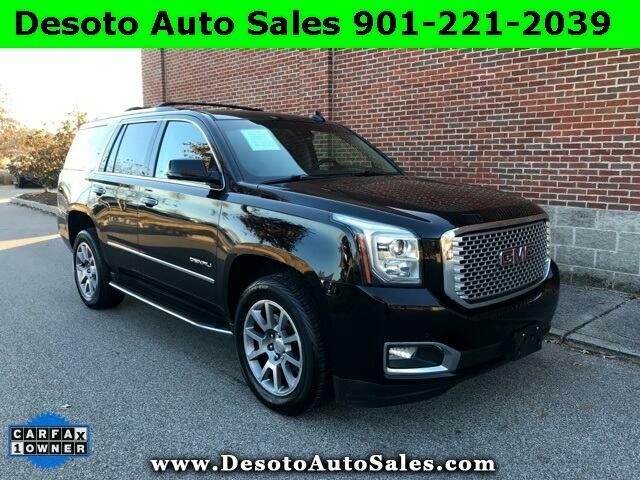 2017 GMC Yukon Denali with ONLY 38K MILES! CLEAN CARFAX, ONE-OWNER. This vehicle offers a sharp looking color combination of Onyx Black paint with Jet Black LEATHER. Automatic transmission, Power locks, Cruise, 20"Wheels, NAV, Dual Power Heated/Cooled Front Seats, Remote Start, Push Button, Mid Row Seat Heat, Backup Camera, Bluetooth Compatible, AM/FM/XM/CD/Bose, Enhanced Driver Alert Package, Forward Collision Alert, Front dual zone A/C, Heads-Up Display, Heated steering wheel, Integrated Trailer Brake Controller, Intellibeam Automatic High Beam On/Off Headlamps, Lane Keep Assist, Low Speed Forward Automatic Braking, Memory seat, Power door mirrors, Power Liftgate, Power Release 3rd Row 60/40 Split-Folding Bench Seat, Power Release Second Row Bucket Seats, Power windows, Rear A/C, Rear Cross-Traffic Alert, Remote Keyless Entry, Spoiler. Powerful 6.2L V8. This vehicle has been checked out by our service department and has passed inspection. Drive this Beautiful 2017 Yukon Denali with No Concern for any possible future repairs by extending any remaining warranty up to a 120K mile Bumper To Bumper Warranty for only a few dollars more per month. Desoto Auto Sales will help you save money while having the easiest car buying experience of your life! Open 9-7 during the week and 9-6 on Friday and Saturday. Closed Sundays. THANK YOU! Desoto Auto Sales is located at 5704 Goodman Road in Olive Branch, MS. We stock hundreds of vehicles every month, most at thousand of dollars below what other dealers charge. Our low no haggle internet prices are clearly marked on every vehicle. Our staff works on salary. At Desoto Auto Sales you will never waste time or stress out negotiating price or dealing with pushy commissioned sales people! FINANCING FOR FAIR, GOOD, AND EXCELLENT CREDIT - We have lenders that offer low interest rates. Most of our vehicles can be financed with 0 down for up to 72 months. The combination of low rates and flexible terms allows customers with a good credit rating to get a low monthly payment, often much less than expected. FINANCING FOR POOR CREDIT - We have lenders that can help you. Bring your most recent paystub and your ID. A down payment of 2000 dollars or more recommended. Trade ins welcome. Thank You!